by Fabián Harari (in El Aromo n° 41, Laboratorio de Análisis Político – Political Analysis Lab). Translated by Leonardo Kosloff. Having chicken-pox at twelve years old is not a bad business: it is nothing serious and one can miss school for two weeks. No one would ever imagine that someone could die from an illness like that. But that was the case of Tamer al-Yasji. Tamer had to put down a fever and needed some medicines or, at least, water. 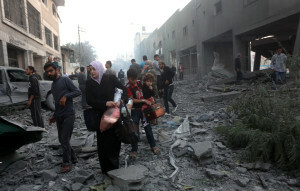 The Central Hospital of Gaza could not do anything more and Israel was not permitting any access. His tragic story is shared by many other kids: 17 in total, of a list of 98 people whose lives depended on being assisted in some hospital with basic materials . Gaza is blockaded since June 2007. The deaths we mention took place in twelve days of January in which there was total isolation. Hamas prevented what could have been genocide. With no previous warning, it blew up part of the wall separating Rafah from Egypt and 600.000 Palestinians crossed the border to look for provisions. Even though the media diverted attention away from the problem (after a certain softening of Israel) the threat of a humanitarian catastrophe, or a coming war, is still latent. The situation has been dealt with the characteristic superficiality of the bourgeois prism. For the most part, analyses oscillate between the terrain of incidental witness accounts and the emphasis on the cultural or national problem. Nevertheless, the causes of the problem are to be found in that which makes Gaza what it is.The region consists of 360 square kilometers with 1.5 million inhabitants. One of the highest population densities in the world. Of that total population, two thirds live in the 8 UN refugee camps. Unemployment reaches 35%, without taking the female population into account. 80% of the population is below the poverty line, and the UN gives food aid to 860,000. The UN calculated that 72% of the population is under the risk of malnutrition. The high population density originated with the 1948 war, through which the Palestinian residents of Israel were expulsed to the West Bank and Gaza. With time, a certain economy took shape in the latter. Being a region apt for fruit crops, it developed an export agriculture. The food sector was one of the most important lines of production, with the well-known company Awda as its great motor. Capitalist expansion in Israel, however, required an army of workers which Jewish immigration could not provide. In 1968, the Israeli army dismantled all the key crops in Gaza. In 1979, Egypt compromised not to receive any Palestinians. Thus, the heart of economic life in the occupied territories was constituted by migrant workers, i.e. labor workforce who works in Israel. Gaza became, together with the West Bank, a great pool of cheap labor power. While the Jewish worker could join a union and had all the welfare benefits, the Palestinian worker was a subject with no civil rights whatsoever. Racism, then, had the function of ideologically sanctioning an economic advantage for capital accumulation in Israel. A lot of the large-scale industries had basements where Palestinian workers would have to spend the night in long working days . In this diagram, Palestinian organization within Israel was extremely difficult. The PLO worked in exile and the most important actions appeared in the framework of foreign intervention (through Syria, Egypt, or Jordan). The qualitative jump was made with the first Intifada in 1987: a popular rebellion with the participation of the local organizations. This panorama changed radically in the 90’s. From 1989 to 2004, Israel received 1,180,000 immigrants from countries of the East and Africa . These are people of Jewish origin who sought protection under the law of return . Of them, Russia provided 962,000 and, the majority, settled in low qualification jobs . To calculate the magnitude of this figure, it is enough to know that, before the downpour, the Israeli population consisted of 3.5 million people. The new workers were not totally incorporated to the old welfare benefits; in fact, they were subjected to similar norms to those which applied to Palestinians . As a consequence, the importance of the Palestinian labor workforce decreased and restrictions to entry into Israel mounted. In 2005, the Knesset voted a plan to dispense with Palestinian workers. Of 30,000 workers from Gaza who worked in industry within Israel in 2000, this figure was reduced to 4,000 by 2003 . Thus, the attention focused on the natural resources of the region (gas and crops). Settler colonies (which provided economic opportunity for the Israeli population) and expulsions of Palestinians multiplied. From 2001 to 2004 Israel evicted more than 24,000 people . Confronted with the impossibility of continuing the advance over these lands, in 2005 it stopped the building of Jewish settlements in this area and lifted those which still remained. The economy in Gaza was reduced to the food sector, and the growing of strawberries, guava trees and flowers, the majority of them to be exported to Israel. To asphyxiate this last sector the Jewish religious authority declared these fruits to be Taref products . In 2006 Israel bombarded the only electric central and dependence on Israeli energy became complete. From 2003 to 2007 the companies reduced their production levels from 76% to 11% industrial capacity and wages went down by 40% . The Palestinian businesspeople are in the middle of risking strangulation by the Israeli bourgeoisie and the class conflict. Some of them have chosen to relocate . The successive bombardments and military incursions have devastated large areas, thus creating actual ghost towns. This process has produced important transformations in the life of the occupied territories, particularly in Gaza: from being a reserve of labor the region has transformed into a reservoir of relative overpopulation. A region without a state or laws, with an economy reduced to the minimal expression and social bonds in shatters. A source of conflict and resentment, as well as a foundry of militants with nothing to lose. But, at the same time, a place ever nearer to the danger of an epidemic starvation which could turn into a real world scandal. To avoid this, the UN sustains the life of only half the population. Clashes cannot be explained starting from cultural or national confrontations. The essence of the problem has to do with the contradiction generated by the expropriation of the direct producers (in 1948) and their posterior conversion into consolidated pauperism. It is not an ethnic question, but a class question. The characteristics of the conflict have grown sharper for several reasons. In the first place, because the first process (the expropriation) has a temporal proximity with only one generation in between. As a result, the claim for restitution and reconstruction of old relations (the “return”) appears as a permanent element. Secondly, because both processes are concentrated in 40 years, so that the demands reinforce one another. Thirdly, this fraction of the working class is not spread out but is geographically located in a specific region and split apart. Therefore, capital can segregate it and thus make it dispensable. The blockade of Gaza started in June 2007 and sharpened the tendencies toward social decomposition. It took shape in the context of a political process in which Hamas displaced the conciliator fraction Al Fatah from the Palestinian government, in general and legitimate elections. A war between these two organizations derived in the expulsions of the latter from Gaza and the division of the territory: the West Bank for Al Fatah and Gaza for Hamas. Since then, Israel maintains the blockade in Gaza while it negotiates with Mahmood Abbas, leader of Fatah (a secular party). The intention of Israel is to prevent that the Islamic organization actualizes a “state” experience. The worsening of life conditions in Gaza did not hurt Hamas’ popularity but, on the contrary, it increased it. Israel, then, raised the bid and imposed a total blockade. Twelve of the most death swaggered freely through the towns and refugee camps. The attempt to put the Palestinian people on its knees failed. On the one hand, the UN, confronted with the scandal, threatened to cut off all food aid. On the other, the population did not give up and took the problem into its own hands. Now, the option which the Olmert government is shuffling for is war. Taking into account the characteristics of the population, it is not strange that irregular armies came into being on the Palestinian side, like Hamas. However, to reduce its action to the military plane would fail to recognize its political edification. The Islamic organization distributes 70 million dollars per year in social assistance and takes charge of resolving economic and penal lawsuits . That is to say, it is a proto-state. Within a context of social decomposition (absence of an economy and a state), this organization attempts to sustain certain vital social relations. Its funds come from some of the Arab states and from the Palestinian bourgeoisie: the few companies that remain must defend themselves against Israeli strangulation and, in turn, have a certain security that no disinherited persons claim something back from them. The development of capitalism in the region and the process we observed before determines the infeasibility of a two-state program. Neither Gaza nor the West Bank can sustain themselves on their own. Neither is the “return” possible: the lands expropriated in 1948 are today cities, industries and large mixed farming. Therefore, the problem is not Palestinian sovereignty, nor the reestablishment of the old Arab peasantry, but the socialization of the means of production in a unique state. This is an objective which cannot be achieved without bringing the organization of the Jewish masses, in the heart of the region’s capitalism. In sum, it is not the national tasks but the socialist ones which hold the key to victory. 2) See Grossman, David: El viento amarillo, Aguilar, Madrid, 1987. 3) See Ministry of Immigrant Absorption: Immigration Data 2004, February 2005. 4) 1948 law which gives every Jewish person the right to be considered, automatically, as an Israeli citizen and claim their passport. However, the condition of being Jewish is subject to a rabbinic tribunal which examines the “purity of blood”. 5) See Cohen, Sarit y Chang-Tai Hsieh: “Macroeconomic and Labor Market Impact of Russian Immigration in Israel”, HIEBS working papers, 2000. 9) Food not suitable for Jewish people, according to Hebrew law. 10) Página/12, December 17, 2007.